Don’t Miss: Haggling for bargains at Manavgat bazaar! This popular full-day excursion includes a relaxing boat trip during which you can snorkel, swim or sunbathe whilst the crew prepare a tasty lunch, and a visit to the Manavgat bazaar, the perfect spot to pick up a few ‘designer’ bargains! After being picked up from your resort, you’ll head to the harbour to board the boat for a sea cruise before heading along the Manavgat River, enjoying a break for sunbathing and swimming along the way. Other stops as you travel along this old waterway include a visit to a trout farm and a stop at Manavgat waterfalls where the cool, foamy white water gushes over the rocks – the perfect spot to cool off. Back on the boat, enjoy a tasty lunch (included), and keep a lookout for river turtles which are native to the area. After lunch, you’ll head to the large Manavgat bazaar which takes place twice a week. Take time to drink in the sights and sounds of this bustling market where you can buy freshly grown fruit and vegetables from local Turkish farmers and Taurus Mountain ladies who come down especially for the occasion to sell ‘designer-inspired’ t-shirts, shorts, handbags, shoes, jeans and more. And don’t be too embarrassed to bargain for any goods you buy, it is a necessity and expected in Turkey! After the bazaar, stow away your newly-purchased goodies for the scenic journey back to your resort. 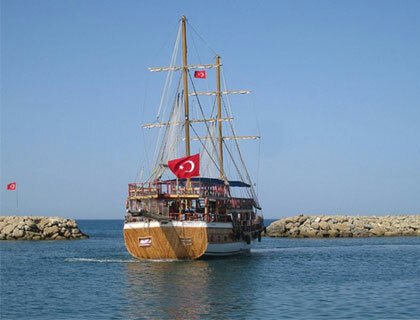 This excursion includes an English-speaking guide, lunch on the boat and round-trip transfers from Side, Manavgat, Gundogdu, Colakli, Evrenseki, Kumkoy and Titreyengol hotels. 1st April to 28th October: Daily. Pick-ups between 9.05am and 9.30am. Drop-offs between 5.50pm and 6.05pm. Drinks and Waterfall entrance fee (approximately €2.50 per person).